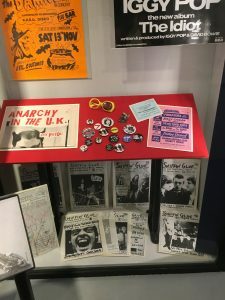 Punk in the East is a digital collection of original punk photographs, gig ticket, posters, clothing and ephemera from Norwich, Norfolk and across East Anglia. As content continues to come in it is fast becoming the largest digital UK punk archive to be found anywhere on the internet. The project first came about when Matt Worley, a Norwich boy turned Professor of Modern History at the University of Reading, interviewed former 70s punk and Norwich Lanes marketing manager Jonty Young. Within a matter of months Matt was compiling a fanzine full of local memories and photographs while Jonty in collaboration with Jenny Caynes, Curator of Community History at the Museum of Norwich, set about the task of finding and digitalising all the content. On October 22nd 2016 to coincide with the 40th anniversary of the first UK punk single, New Rose by the Damned, a 15 venue exhibition opened throughout the Norwich Lanes which attracted thousands of visitors from across the UK. Unlike other similar countrywide events, Punk In The East received no funding whatsoever and instead with an army of volunteers and local shop keepers, put on an eye-catching and thought provoking event(hyperlink to event page) true to the DIY ethos of Its subject.